This month, we launched our Blogger Review Team & we are so excited to share these great bloggers with you! Each month, we will select one product & have our bloggers test it out and share the results with us and other pet lovers! This month, we selected Solid Gold Jerky Treats. Our bloggers had the choice between lamb, turkey and beef. Solid Gold Jerky Treats are delicious, made with real ingredients, are wheat, corn and soy-free and are soft enough for both puppy and senior teeth. Treats can be served whole or broken into small pieces for treat training. All treats come in a convenient, resealable 10oz pouch. Our blogger team is made up of men and women, who blog about lifestyle, food, their pets and Minnesota. If you are looking for new blogs to check out, head over and check them out. See what our review team members are saying about the Solid Gold Jerky Treats! You can read what our other customers are saying about the jerky treats. 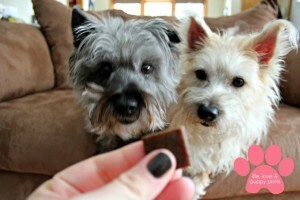 Check out our reviews for the Turkey Treats, Lamb Treats and Beef Treats.